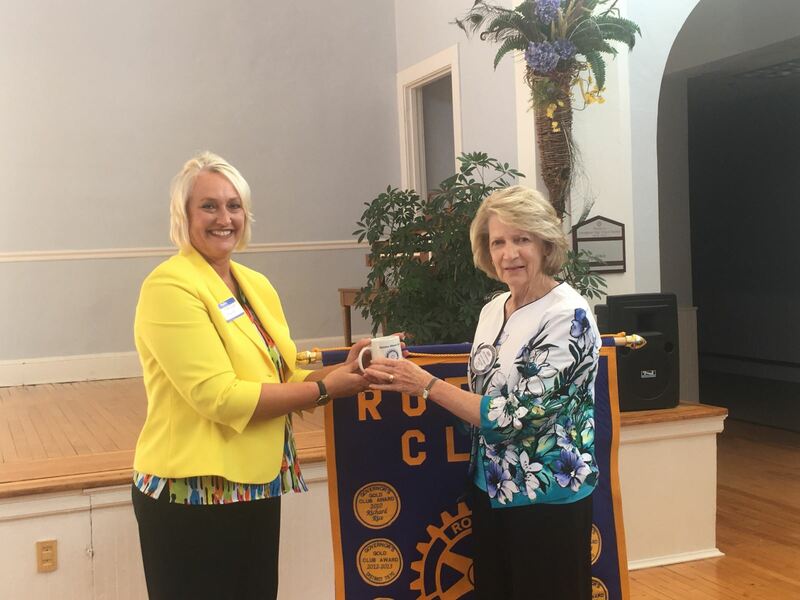 The Rotary Club of Nelson County officially welcomed Dr. Martha Eagle, Superintendent Nelson County Schools to Nelson County during a meeting. Dr. Eagle was the speaker where she addressed Rotary Members and Special Guests. Guests in attendance were Angie Johnson, Treasurer, Lisa Bryant, Clerk of Circuit Court, Pam Campbell, Commissioner of Revenue, and Daniel Rutherford, Commonwealth Attorney to name a few. Other Nelson County Officials were in attendance. Retired Superintendent Nelson County Schools and Rotarian Dr. Roger Collins introduced Dr. Eagle. Finishing the introduction of Dr. Eagle. He said, "The Eagle has landed". Dr. Eagle upon addressing the audience, she gave her vision concerning the Nelson County School System. These included "Empowering generations through excellence in education ...., She stated, " We educate student to become skilled, responsible, productive, and enlightened citizens who contribute to society. She continued by saying, "We are committed to: Learning for all. Maintaining an environment that is conducive to learning. Supporting communication, collaboration and teamwork. Using the growth and learning process as a critical component of our organization. Teaching the importance of mutual respect, character Development and diversity. Dr. Eagle continued by saying her Initial Goals were: To connect with the staff and community; To collaborate with the board and administrative teams in establishing goals for the division; To evaluate and analyze all systems and structures to assure effectiveness; To celebrate the amazing work being done and build on the areas we need to strengthen. Her Overall Goals were: To surpass state accreditation standards based on the revised standards - Achieve Blue Ribbon Schools; To implement the federal Every Student Succeeds Act guidelines effectively and To challenge our students to meet high academic and social expectations to ensure all students are college and career ready as we close achievement gaps. Upon completing her comments she then opened the floor for questions. During the time there were questions and comments made. At the conclusion of the meeting Rotarian President Judy Smythers presented Dr. Eagle with a Rotary Cup.